When designing eLearning or training slides, you probably use plenty of images. Perhaps the images exist in different states of readiness and perhaps you organize them in different ways for each project. In some projects, you may not know what graphics you need until the last minute and in others you could be working from a detailed storyboard that specifies everything. Whatever the case may be, adopting a strict approach to graphic organization and workflow will improve your speed and efficiency. Work is smoother when you do repetitive tasks in batches and when you can quickly find the graphics you need a month or a year later. The more organized you are, the more cognitive resources you will have for being your brilliant self. With all of these benefits, I thought I’d share my workflow and organizational strategy for working with images that you may want to use or modify for your needs. 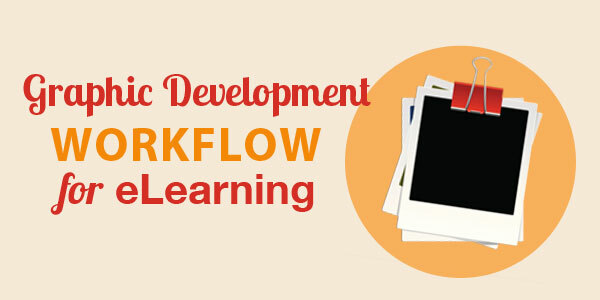 If you are interested in workflow, you may also want to read about a production workflow for developing eLearning. What are the visual needs for this course? What visuals will enhance and promote learning? Have I worked on similar projects from which I can get ideas? The answer might be that you need illustrated diagrams or a custom photo shoot. You might just need some motivational photographs that add to the project aesthetically. When I know the graphic requirements, I start to determine the visual style that would be appropriate. Although the visual style may evolve over time, I try out different approaches in a prototype to see what can work for the particular content and audience. I know from creativity research and personal experience that a solution doesn’t usually come in a flash of insight. It’s more likely to come from playful experimentation, inspirational resources and by giving ideas time to simmer. When I have a general idea of the style, I know what type of backgrounds and graphics that I’ll be using. For example, it might be photographs or simple iconic illustrations. Source Graphics: Original photos and images that will be modified for final use as well as Photoshop and Illustrator files (the type of graphic editor you use doesn’t matter). Some designers differentiate by the tool, creating one folder for each graphic tool they use. I haven’t found that to be necessary. Final Graphics: These are the final version of each graphic that will be inserted into an authoring tool or website. Assets: These are the client assets, such as marketing photos, logos, color palettes, etc. I typically organize both the Source Graphics folder and the Final Graphics folder by topic. As sure as death and taxes, you can count on needing to find an obscure graphic again because of a revision. 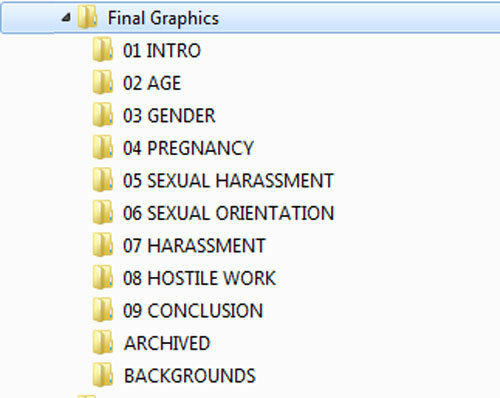 For a recent project on Discrimination and Harassment in the Workplace, I arranged my Source Graphics folder by topic. Adding numbers for the order of topics is optional. I thought I’d try it out. The Archived folder has unused graphics. I’m not sure why I name it that. I probably don’t need to show you this, but the Final Graphics folder looks exactly the same, as shown below. The final graphics are the ones inserted into the course. They will look different than the originals and they will typically be a smaller file size. Now I’m ready to seriously gather the visuals. How I work depends on where the graphics come from. Stock Photo Downloads. Searching through images can take a long time because it’s often difficult to find the appropriate ones (see 21 Reasons Stock Photo Sites Make Me Cry.) It saves time to do this task in batches. That is, it’s more efficient to search through a stock photo site for multiple images then to search for one at a time as you go along. The search results may show related images where you can spot one you’ll need later in the course. This is akin to catching two fish on one hook. So before I start my search, I identify a batch of images that I will need. Photo Shoot or Illustrations. If I’ve completed a custom photo shoot, that means it was planned ahead with a shot list. So it’s easy to download all of the photos at one time from the photographer’s site. For more on doing your own photography, see how to get the best shot for eLearning. An illustrator, on the other hand, may provide you with images over a period of time as they are completed. Original Graphics. If I need to create graphics from scratch, such as in Illustrator or PowerPoint, then I find it’s best to do this in batches too. The point is that every time you switch a task, there is some cognitive overhead associated with it. An Aside: Why differentiate between source and final graphics? Reducing the resolution to reduce the size of the file. Many stock photos are 300 dpi (dots per inch), which has the detail you need for print, but not for web display. If you reduce the image to somewhere between 72 to 125 dpi or ppi (pixels per inch), you will reduce the file size. This can improve the performance of a running course or of a website. Reducing the dimensions to reduce the size of the file. Many photos are giant beasts, nearly two or three times the size that you need. Now what about you? Please share your graphic development workflow in the Comments section below. Nice article. I’ve seen so many times where people couldn’t locate the graphics or such later. A little extra planning goes a long way towards a smoother project and smoother update. One other thing that can be quite helpful is if you have a graphics management tool (like say the one in adobe suite) or use a cloud based authoring tool so you can have all the items organized and in one place (or organized by tags/names/search) instead of folders. You’re right, Paul. And I should have written about that. For people or teams that have a good quantity of images, some form of image database or graphic organizing application with tag capabilities would be essential. Thanks for your comment. Great article! I have this huge mess of a graphics file that I need to organize, and your article has motivated me to address this! The information that you provide here in your post is crucial toward making any graphic development workflow progress very smoothly. Thank you for your insights and suggestions. What stood out even more is the subtle point you make in your explanation of how best to review your graphic needs. Typically, many, new instructional designers believe that success relies heavily on innovation, so whenever they are creating content, they tend to work very heavily on generating new material. Why do this if someone else has already created content that will do the job just as effectively if not more? By gathering material from others that add what is needed for the project, with permission of course for copyrighted material, the convenience of having such material is a benefit that can lead to a very productive workflow as well.